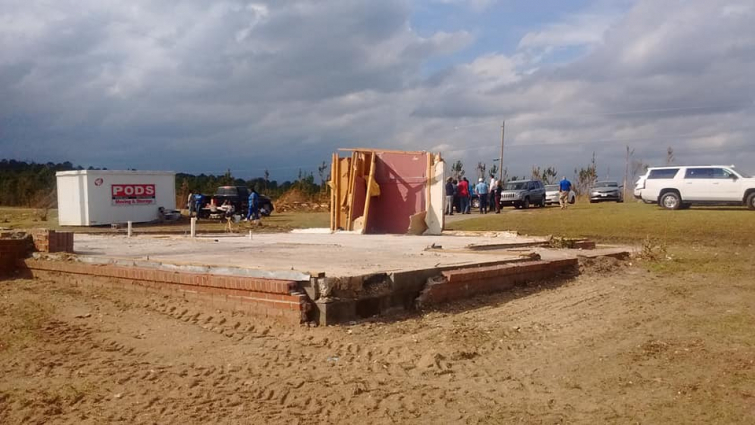 The devastating EF-4 tornado that recently tore through Lee County, Alabama, destroyed almost everything that stood in its way. One Christian family, however, survived in a miraculous way. They were all sitting inside a prayer closet, which ended up being the only part of the house that was left standing, reported CBN. "My God is awesome!!! Shout somebody!" Jason Smith decided to go to the tornado zone to minister to survivors. He serves as a chaplain with the Billy Graham Rapid Response Team. What Smith ended up seeing there ministered to him, a piece of slab left from a home that had been demolished by the storm, according to 11 Alive. Smith posted images on facebook and the post started going viral. "Listen to me please. I just left a family who survived the tornado in this house and the only left standing is this closet," Smith wrote in the Facebook post. More miraculous stories have emerged from the tornado. In another article, CBN News reported that 40 kids were miraculously shielded as they sang "Jesus Loves Me".